Porsche is in the midst of developing its next-generation Boxster sports car, which has been seen undergoing testing in prototype form on a number of occasions in recent months. The new car is expected to go on sale late next year as a 2012 model and according to a new report Porsche may be planning a special fuel-efficient model. 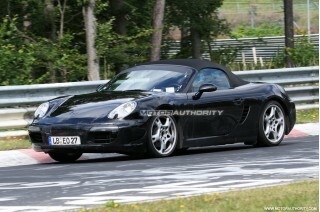 A rumor alleging that Porsche insiders are talking about a lightweight, turbocharged four-cylinder platform for the 2012 Boxster recently began making the rounds, however, the carâ€™s model line director, Hans-Jurgen Wohler, has revealed to Autocar that a turbocharged three-cylinder powerplant may even be possible. Installing a downsized engine would be one way for Porsche to reduce its fleet emissions in line with tough new government standards coming into play in the U.S. and Europe over the next couple of years. â€œA Boxster with a four-cylinder engine, or maybe even a three-cylinder turbo, could produce between 180 and 200 horsepower,â€ said Wohler. â€œGiven the Boxsterâ€™s history–that it started with a 200 horsepower, 2.5-litre engine–I think this is possibly something that customers could accept. The thought coincides with possible rumors of a revived 914 that could be co-branded by both VW and Porsche, targeted at different market sectors, which means the new Boxster could certainly be fitted with a compact turbocharged mill. If thatâ€™s the case, we’re sure Porsche will still offer a six-cylinder option for upper range models.